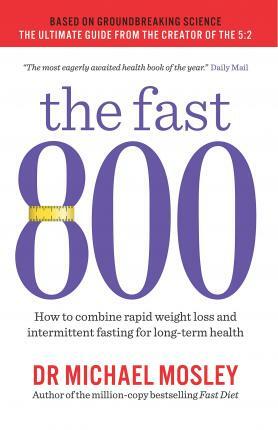 Includes an exciting new evidence-based approach called Time Restricted Eating (TRE), which can be used in tandem with the Fast 800 to accelerate results. Includes more than 50 calorie-counted, Mediterranean-style recipes by Dr Clare Bailey, wife of Michael Mosley and the author of the bestselling 8-Week Blood Sugar Diet Recipe Book. Working on his personal rationale that he always tries the things he recommends, Michael puts on nearly 10% of his body weight for the book - about 14lb - and then test-drives the Fast 800, with stunning results. 3 million copies sold internationally across the three existing titles (rights sold in more than 40 territories worldwide). From late Feb 2019 through to end of March, Michael will be on a speaking tour of the UK, discussing the book and the science that lies behind it. "Not so much a diet as a new way of living. I've followed Michael's advice ever since my third bout of cancer and I have not looked back" Patrick McIntosh, who at the age of 58 became the first man to walk to the South Pole after surviving surgery for bowel, skin and prostate cancer.